Our gear is finally dry so we headed into Montblanc, an area that has been inhabited for thousands of years. After the invasion of the Moors in 711 AD, the 10th and 11th centuries led to a period of peaceful coexistence of Muslims, Christians and Jews. This productive period continued until the Roman Catholic Church initiated an era of expulsions, which forced the Moors, the Jews and many of the interbred mixed race peoples to leave the Iberian peninsula. 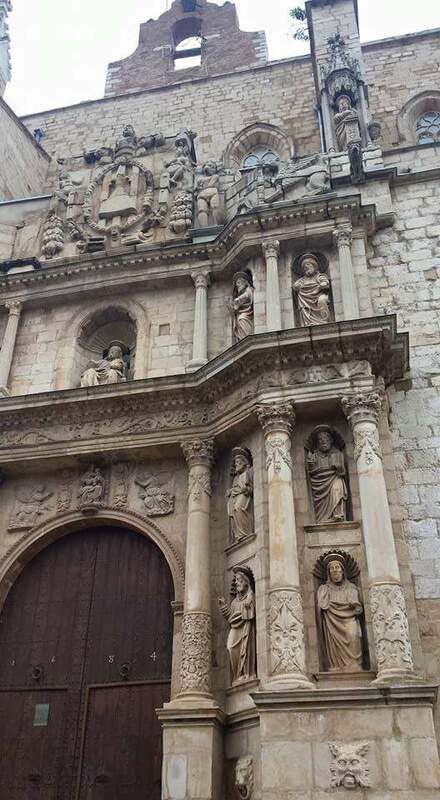 We were able to ride through the gates of this walled city and wander freely along the cobblestone streets stopping to snap a few photos of the ancient buildings and churches, waving at the many people that smiled and waved at us as we passed. 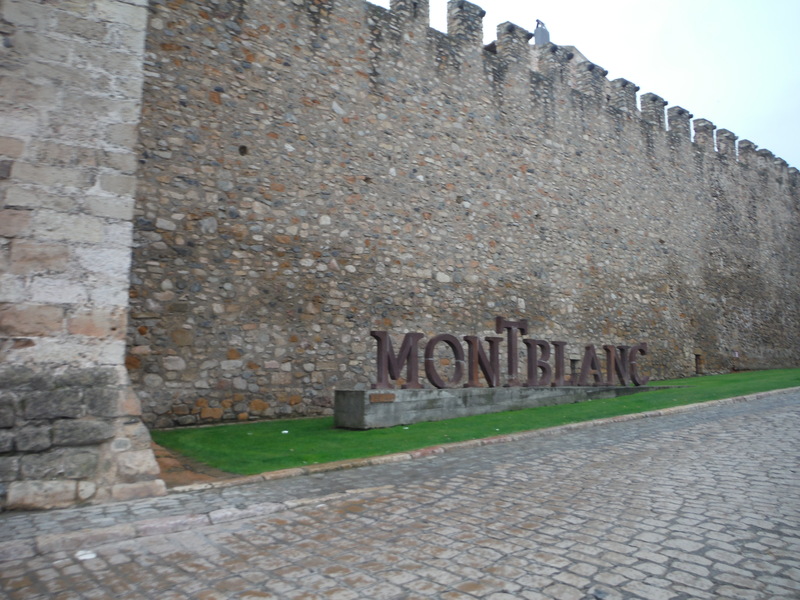 Leaving Montblanc we rode a short distance to the Poblet Monastery from 1151 AD. Poblet was the royal pantheon of the kings of the Crown of Aragon. In 1318, under solemn oath, it was made a condition that all the Aragonese kings be buried there. 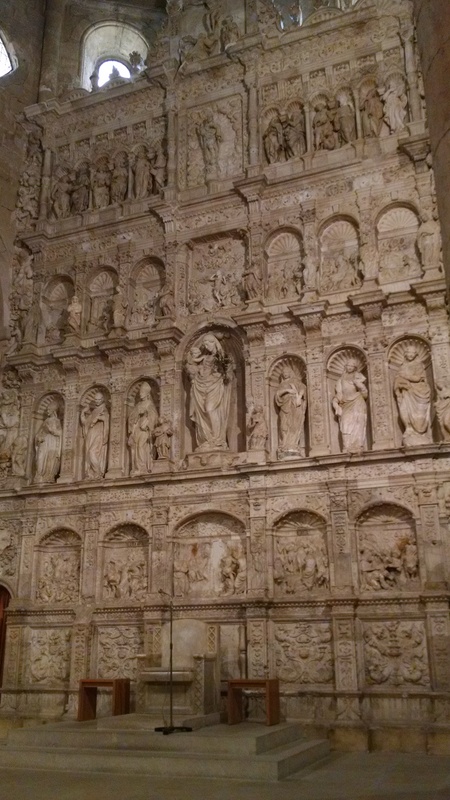 Some of the most important royal sepulchres have alabaster statues that lie over the tomb. The kings have lion sculptures at their feet, while the queens have dogs. Poblet Monastery has been a UNESCO heritage site since 1991. 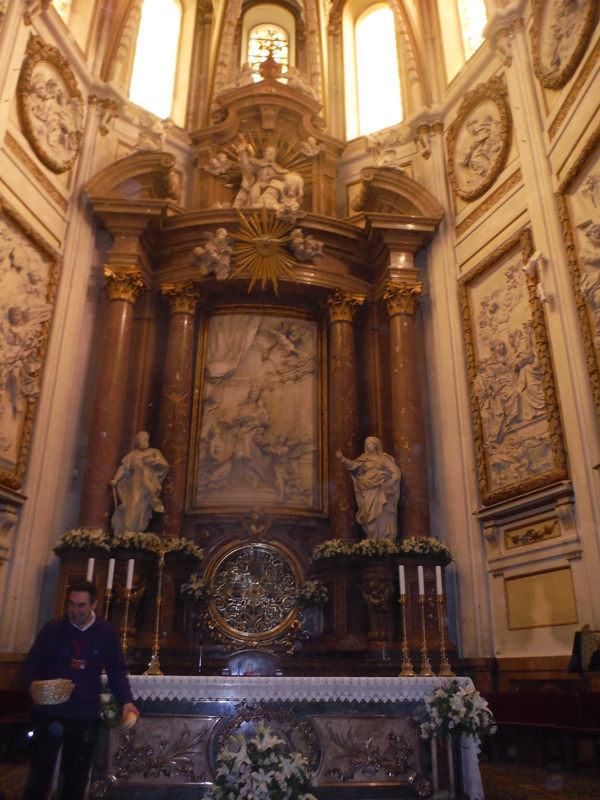 Our tour included access into the monks chambers and also their private areas. This place was amazing. 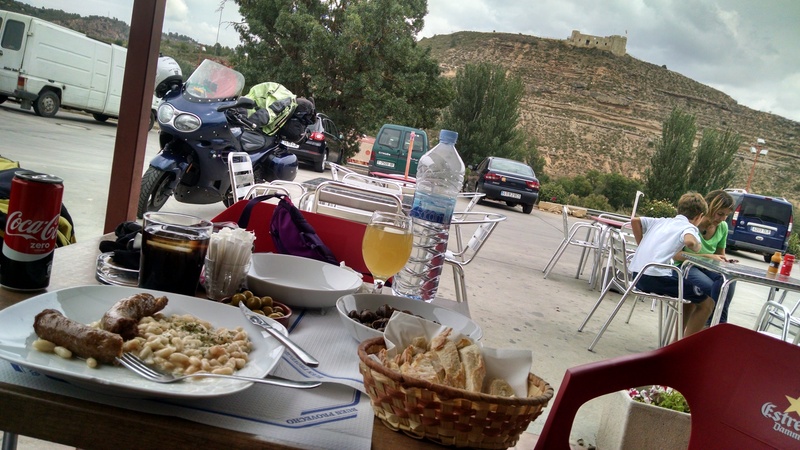 Stopping for lunch at a gas station offered a touch of life along the river in a small village in Spain. The gas station had a small cooking area offering fresh-water delicacies found in the river in the area, including snails. The wonderful ladies working in the kitchen offered me a taste of the various delicacies and I decided on a bowl of snails cooked in a thin, clear garlic broth. 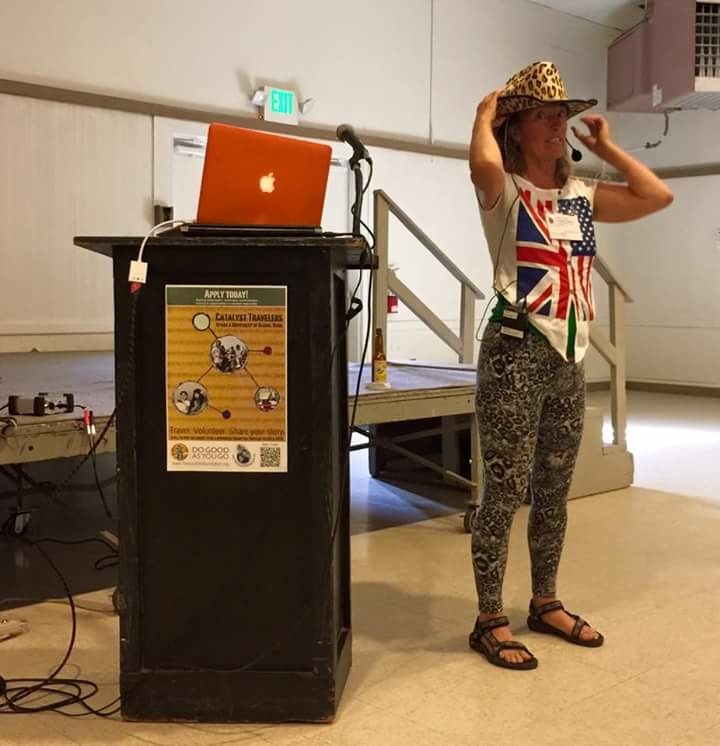 One of the ladies was from England so we had a brilliant time kidding with each other and us learning about why she had ended up here. Melanie ended up eating a couple local sausages and both lunches were excellent. 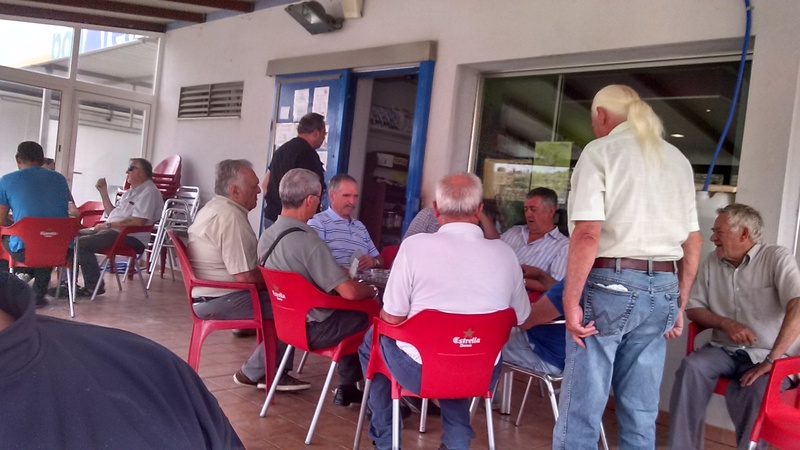 At a table near us a group of men were playing games and discussing local events. They didn’t speak much English but we had a good time with everybody using our limited Spanish and hand gestures. The day remained cloudy with occasional rain which turned into rain followed by small pea sized hail. After having enough of the weather we decided to find a hotel for the night in Utrillas, the Hotel de Utrillas. The morning brought blue skies and the promise of a great day. 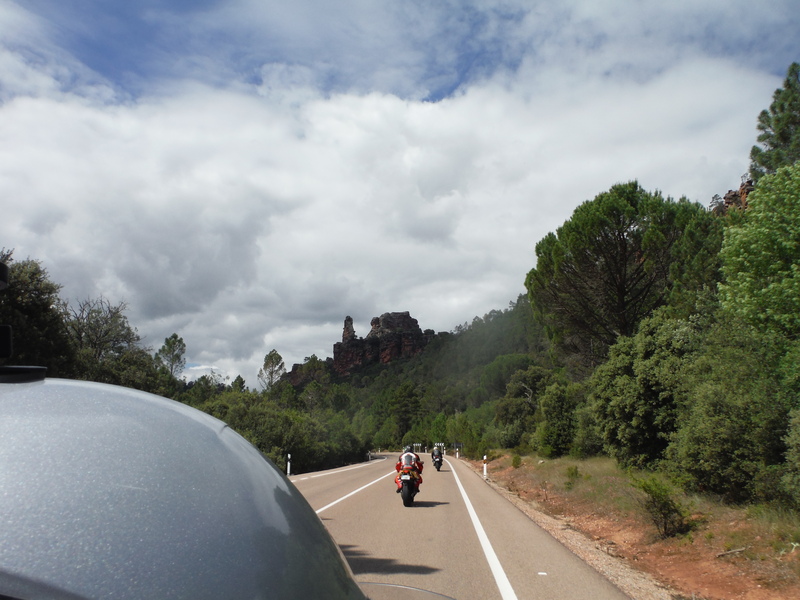 Our ride followed the side of a ridge of mountains and curved in and out on deserted roads, except for motorcycles, on the way to Cuenca, and the Cuenca Cathedral, the Cathedral of Santa Maria Maggiore. 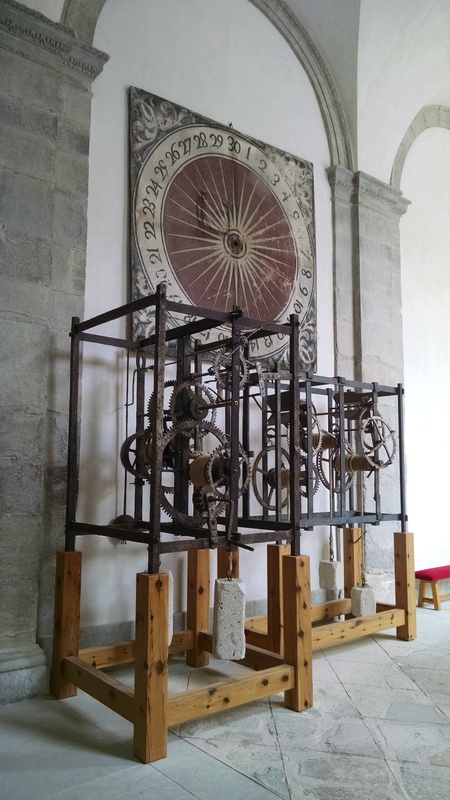 Work began in the year 1196 and was completed in 1257. 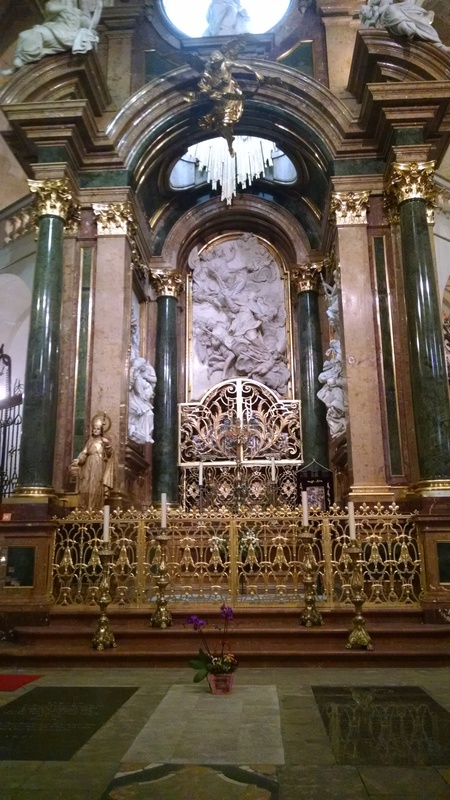 The interior is in the Latin cross configuration with a central altar, a choir area with pipe organ and many individual chapels around the perimeter. The cost to tour this brilliant place was only 3,80 Euros. We had lunch and a beer at one of the many cafes in the street outside of the cathedral. Several couples were enjoying the views of the old town in the shadow of the impressive Cuenca Cathedral just 30 meters away. 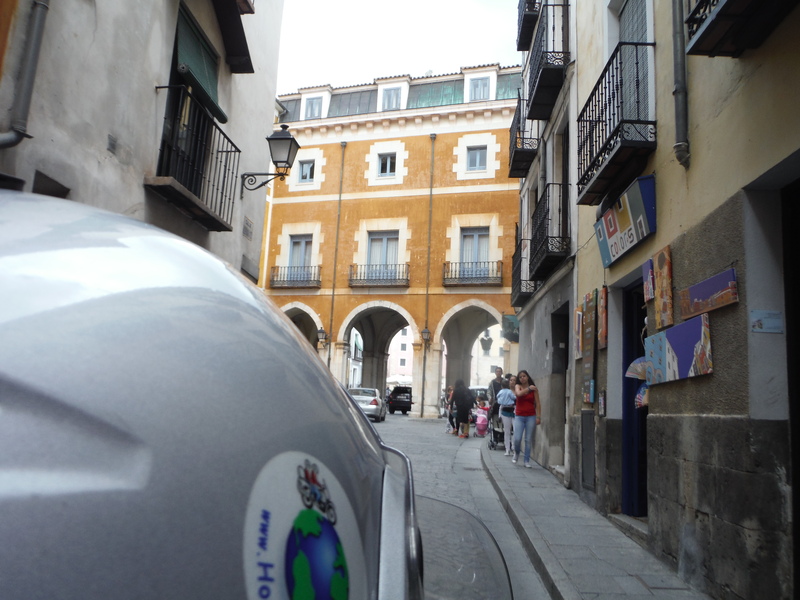 We left and rode into Toledo, into the walled portion and up to the top of the hill looking for a place to stay. 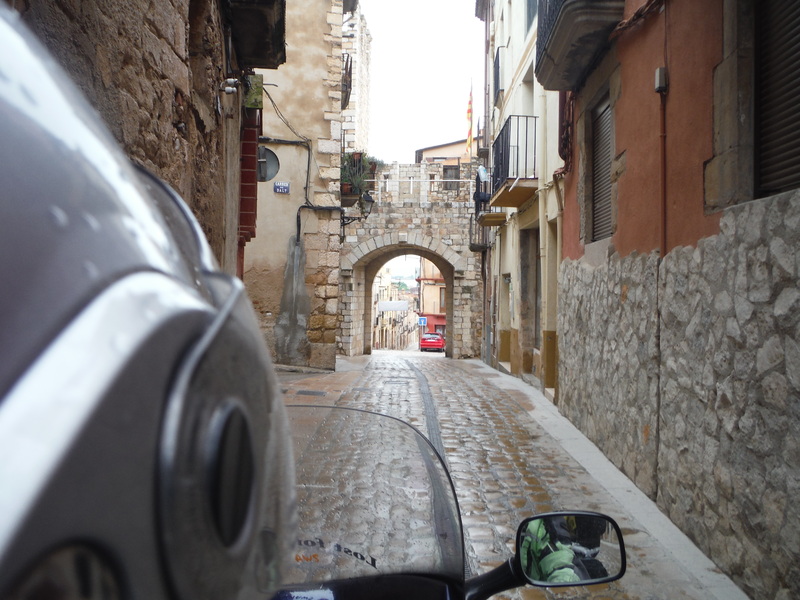 The roads were tight and cobblestone with some busy traffic and most of the places were full, so we continued on. It was starting to cloud up again threatening rain and we found a little cabin at a campground on the river on the outskirts of town, the Camping El Greco. I laid all our gear out to dry and walked to the restaurant for a bite to eat. Just after ordering the skies opened up, which had me sprinting up the dirt roads while avoiding the large mud puddle forming from the downpour. I gathered our gear and had to wait for several minutes for the rain to let up before heading back to the restaurant. So much for dry gear but tonight, after a good meal and another inexpensive bottle of red wine, I will sleep like a baby. The next morning was overcast and we decided that our southern route through Spain would have to wait for another time,We were just running out of time and to go that far south, I wanted to spend at least a week in Morocco, wasn’t going to happen without sacrificing the northern coast of France. Next time. The west coast of Portugal would have to wait also, but the northern coast of Spain and northeastern area of Portugal would get fair treatment in the next few days. 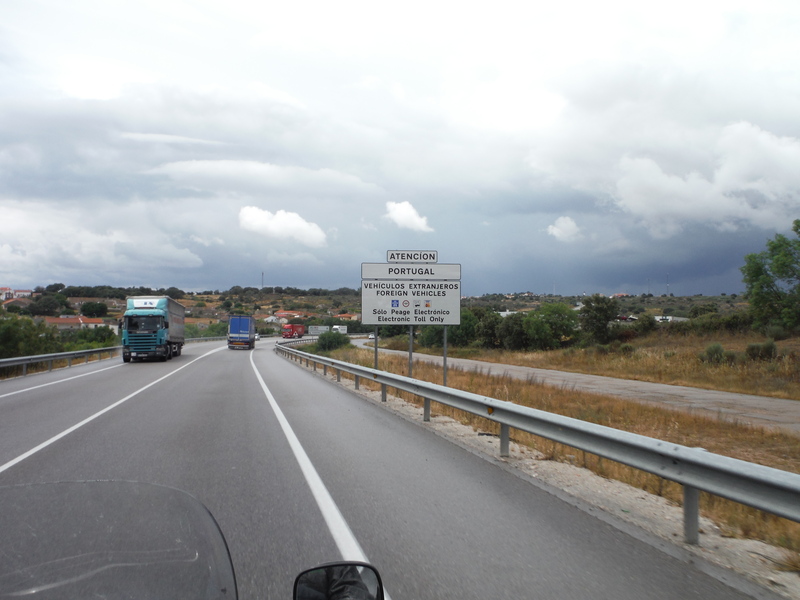 As we crossed into Portugal a toll road sign was posted which had me making the first turn off the road as I could. Toll roads, in my experience, means more traffic, less small towns and less friendly people. We came across a road marked as N-222 which headed the direction we were going. A side note; this road popped up on FB later that night as one of the top driving roads in the world by a car rental company. Better to be lucky than good. Anyway, this road was brilliant as it passed through several small towns. Since it was getting on in the day and we wanted to stop and enjoy some sights and people in a small town we saw a sign for lodging. Pulling into a small village on a cobblestone street the road got very narrow and steep. The room for rent had long since been abandoned and their was no way to go but forward. After a few close calls on the steep, uneven and off canter streets we came to a section that was at about a 45 degree angle up around a crazy off-canter right turn and disappeared out of sight, still going up. Melanie wanted off, so, under protest, I let her get off. Smart lady. I gunned it heading up to discover as I near the turn I didn’t have enough room to turn. Jamming on the brakes and laying on the tank I grabbed the front brake as I needed both feet on the crazy angle and I didn’t want to flip over backwards. After sliding backwards several feet I finally stopped. I knew I couldn’t slide all the way back down the hill and up was the only way out. I let off the brake slightly, moved an inch and slid three. Finally I got positioned for the turn and laying on the tank took off determined not to stop till I got to the top of whatever lay ahead. I finally made it and shook until Melanie walked to the top. Lesson learned, when Melanie wants off, no discussion, let her off. We rode to the next town and found a top notch hotel and the kind lady at the desk gave me a two room suite, with breakfast, for only $35 US. Walking into town we came across a street vendor who must have been a Portuguese comedian. We order a couple of his specialties, sausages, and had a fun time joking with him and his customers as they came to the stand. It was a fun night. What a fantastic week. Packing up our gear into the trailer along with the new motorcycle adventure gear that WANDRR Motorcycle Tours is carrying in North America, direct from Australia, Andy Strapz, was, and always is, so exciting that sleep evades me the night before leaving. Riding out early so as to avoid the heat of the day we, including our pup, Gypsy, rode a couple of canyons and over a couple of mountain passes while making a crooked beeline for the Pacific coast and Morro Rock. On the lookout for wildlife the only thing we saw was a BIG, hairy Tarantula big enough to cast his own, long shadow. Two Up with a Pup. Gypsy is along for HU. Under blue skies with an occasional jet contrail, the 180 degree views of the Pacific Ocean came into view as we turned north on Highway 101 and we paralleled the ocean stopping in the funky little hamlet of Cayucos for gas and tacos. This little town seems lost in time as the kids are typical SoCal from 20 years ago with surfboards, skateboards, and dogs hanging out of the windows of old VW buses. View of the Redwoods from our tent. 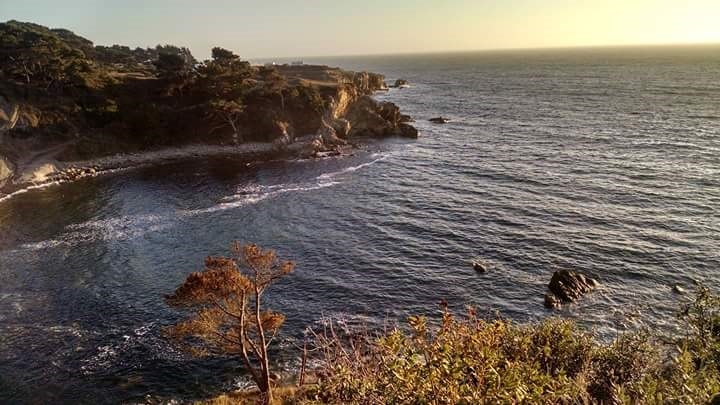 We continue to push up the coast with the views of the Pacific enticing us with what is to come. Pulling over north of San Simeon we got thinking about what life would have been like in the days that Randolph Hearst had his summer home high on the hill with incredible views and the stars of Hollywood visiting his grand castle. 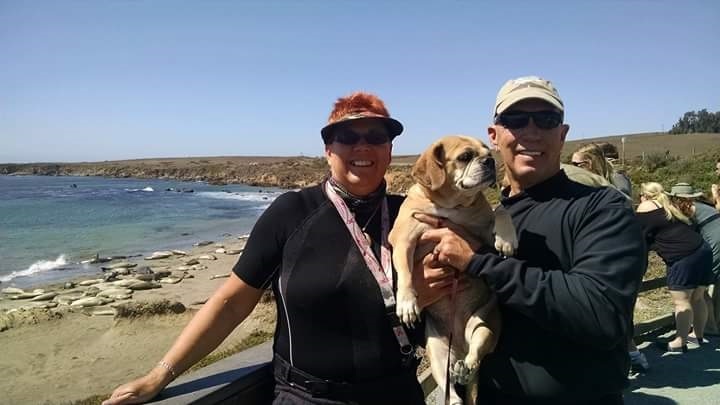 A couple more miles and another must stop at the Elephant Seal Vista Point. Standing by the fence and watching this huge beasts sleep, play, and fight for dominance is always a thrill. On the beach is a herd of maybe 200, from small yearlings to big bulls of over 2000 pounds, tossing sand on their backs and standing up while fighting and bellowing. What a sight as the waves crash along the shore and on the many rocks in the surf that forms a protective barrier for the pups that are born here every spring. Continuing along the unprotected curves, mountains and vistas that make up the PCH, CA1, we twist and turn while heading to the coastal redwood forests north of Santa Cruz, passing through Carmel By The Sea. I have been told the redwood forests here are just as nice as the ones in north California. As we turn north on Highway 9 heading north toward Boulder Creek the redwoods close in on us and force the evening light to hurry away as we find a campsite in a redwood grove with our tent completely surrounded by several trees with their huge trunks thrusting straight toward the sky, leaving a small opening for light to penetrate to us in our tent a couple hundred feet above. 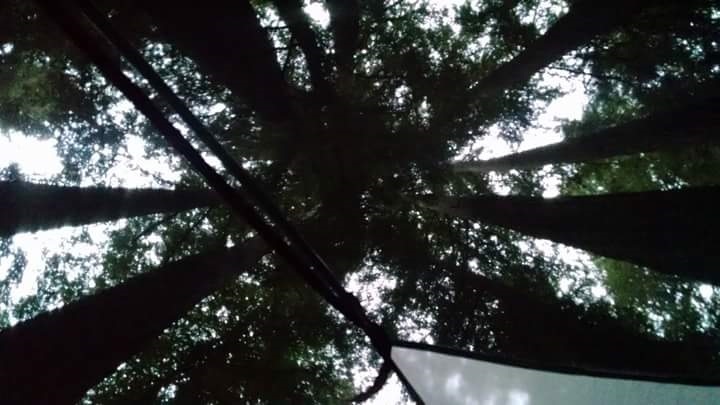 Waking up to a cloud cover and deep under the redwood canopy it is so peaceful as we lay in our bags and just look up, enjoying the smells and views of these giant trees. But,alas, breakfast is calling and a trip up along Highway 35 to Alice’s Restaurant is on the list. This is not the restaurant from the song, but is an iconic stop when riding in the area. 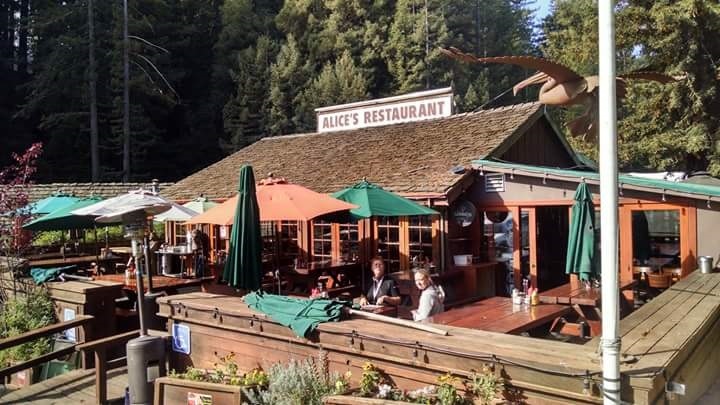 Alice’s Restaurant serves up a hearty breakfast on the wooden front porch, (Gypsy was welcome and enjoyed the sausage off my egg sandwich), with views of giant redwoods in all directions. After eating we rode back down to the coast at Half Moon Bay, headed north across the San Francisco bridge, no tolls northbound, down to Stinson Beach, and north along the coast in an area I have missed riding for years, the Sonoma coast. This area is fantastic! The facilities are sparse and the road zigs and zags in low gear pleasure with nothing but views of the unspoiled coast and Pacific and inland woods, mountains and fields. This is where the happy cows and sheep live in California. We passed a small road motel high on the hill with a restaurant/bar and hot-tub with views of the bay as the sun dipped low into the Pacific as we sat chatting with several guests and the owner sipping our adult beverages. Today we will make our way to Horizons Unlimited to camp with a few friends and meet some new ones. We pull into one last overlook before turning inland, high above a seal nursery in a protected area on the beach. Come spring, the babies will be born and nursed on the coastal area before moving on. Riding through Napa valley we stop for lunch at my favorite winery, V. Sattui winery, for a tasting and deli lunch in the gardens and grassy area around the buildings. 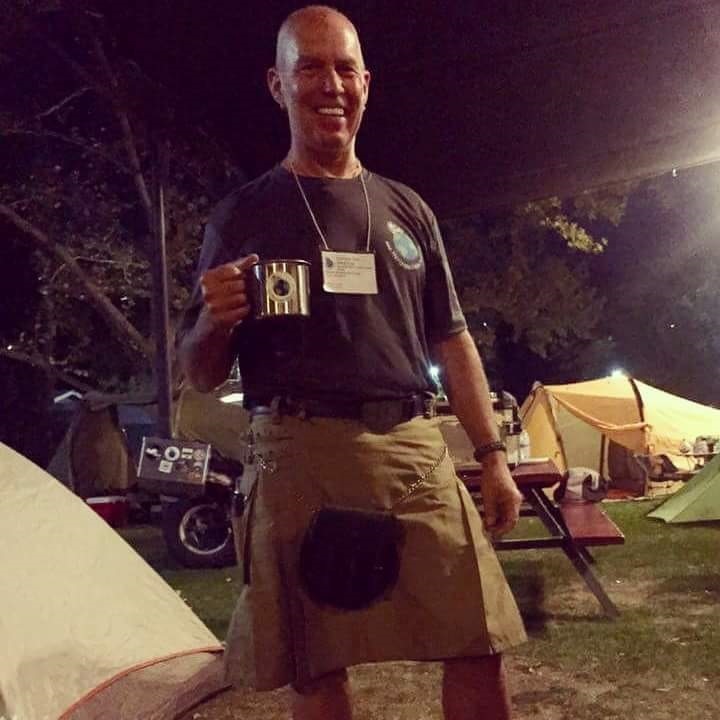 We arrive to HU and find our campsite for the next four nights and dig in for a few days of meeting people, enjoying and learning during the presentations, and hearing of people quitting jobs to begin their own RTW adventures. This is a great group of people and I can’t name everybody that makes up this “family” of travelers. 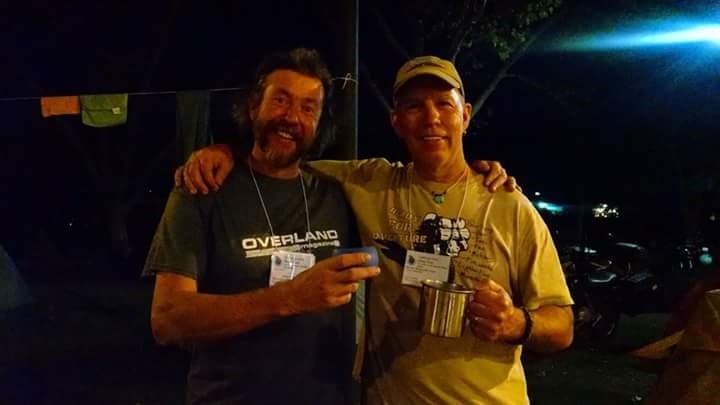 Some we see year to year, some are off on their own long adventures, and some we may never see again as they are traveling through and will be on to other countries. We have a great time with music, craic and grog seeming to take up the evening hours and into the night. Much too quickly the fun times come to an end and we all scatter in many different directions, like the wind. Ride safe, my friends, and see you you on the road.